For my birthday my wonderful roommate, Jenny made me dinner. We decided not go out to eat because it was a school night and I'm old lady and am usually exhausted by 5:30 pm and just want to stay home on my couch. 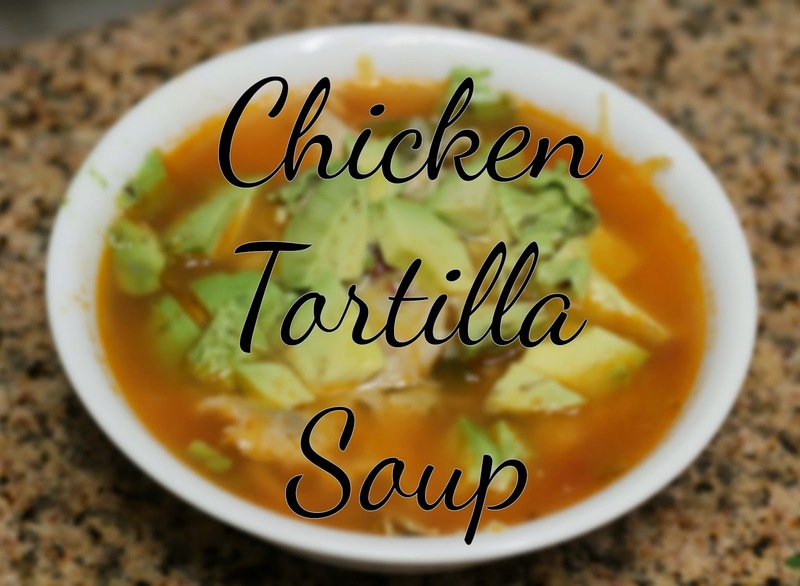 Jenny asked me what I wanted her to make in honor of the day and I immediately knew I wanted her to make Chicken Tortilla Soup or as Ina Garten calls it Mexican Chicken Soup. You can find the original recipe by clicking here. But I'm going to share with you Jenny's recipe. She follows it pretty closely save for the homemade tortilla strips. Now, Jenny decided to just use all the carrots in that bag and all the celery. So our soup was very chunky. But I like it that way. If you don't, then definitely stick to the amounts above. One// Take your two chicken breasts and season with olive oil, salt and pepper. Then toss them in the oven for 30-40 minutes. The chicken is going to be absolutely delicious. I promise. It took all we had to not just eat the chicken before putting it in the soup. 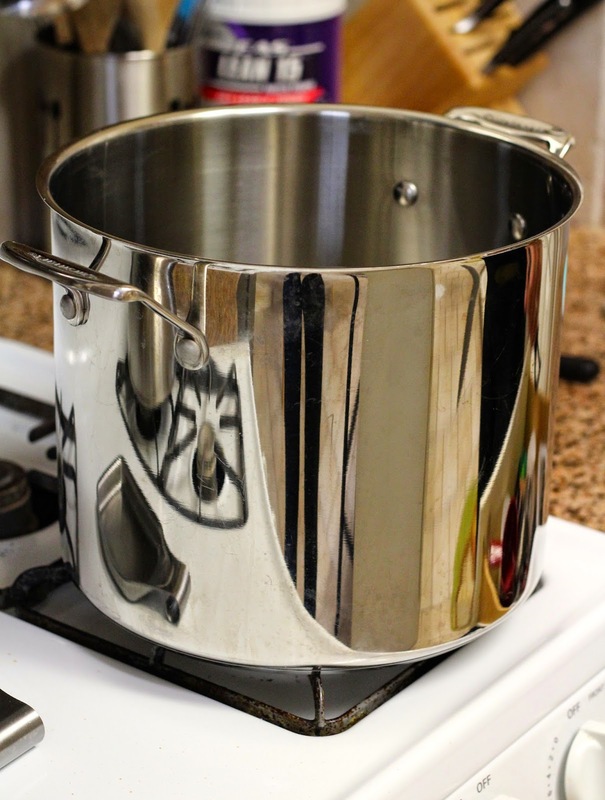 Two// You'll need a large pan like this one or something similar to cook the soup in. Three// While the chicken is in the oven, you prep all your veggies. Chop the celery, peal and chop the carrots, and onion (forgot to snap a picture of the onion chopping). These all get thrown into a mixing bowl. Place to the side. Four// Mince your 4 garlic cloves. Then de-seed and chop your jalapeños. 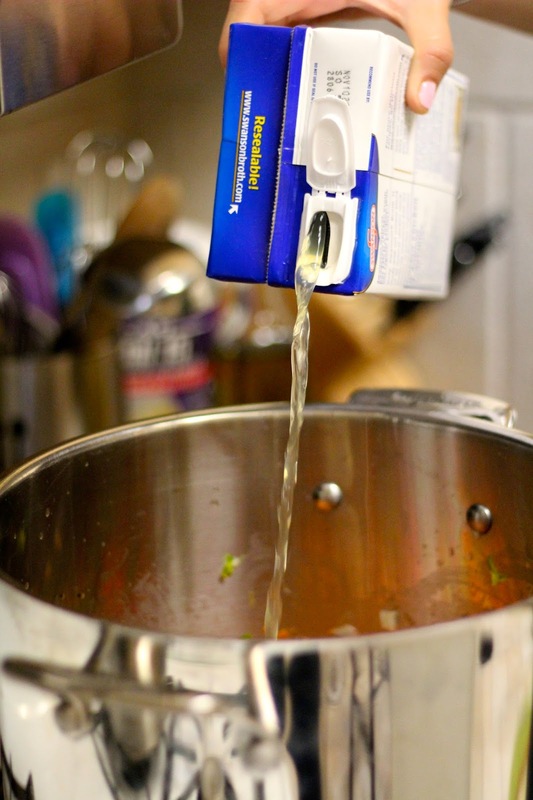 Five// Next pour about 3 tablespoons of olive oil into your soup put. 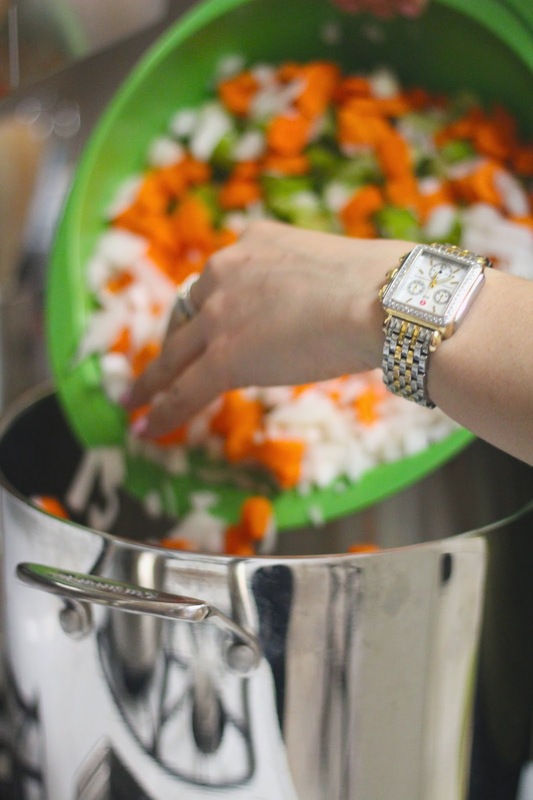 Add your mixing bowl of onions, carrots, and celery into your soup pot and start to sauté them. Six// While those are sautéing take you can of whole tomatoes and "squish" them with your hands to make them chunkier pieces. Then add the jalapeños, garlic, cumin, and coriander to the mix. Seven// By this time the chicken will be ready to go. Take it out of the oven and let it cool for a few minutes and get ready to shred it! Eight// Pour your chicken stock into your soup pot with the veggies. Pour your tomatoes mix into your soup after the chicken stock, followed by the more salt, pepper, and the chopped cilantro. Nine// Take the cooled chicken and shred it into a mixing bowl. (We just used the same bowl from the tomatoes and veggies. Ten// Throw your chicken in that pot and all that yumminess cook for about 20 or minutes. Eleven// Serve and garnish with cheese and my personal favorite avocado. I also threw some southwest tortilla strips that I use for salads in my bowl. It was delightful! Well there ya have it. Total with prep and everything the soup takes about an hour . Super easy prep though and the outcome is delicious. We have a ton of left overs and so will you if you follow the recipe. PS. I'm am totally LOVING my new camera! I've been practicing a ton and learning a ton. Photography is so fun. Def found a new hobby! Happy Tuesday. Your pictures look so great! I am glad you are getting to practice before your big Europe trip! On the topic of tortilla soup... GET IN MY BELLY!